Where can you find tutorials? If you are looking to learn more about CAD modeling or advance your CAD skills, a great place to visit is our Tutorials section. There you can find thousands of how-to guides from which to learn. From simple tutorials like 'How to create a projected curve' to more advanced 'How to make a car engine', there is something for everyone! Navigate to the Tutorials section by selecting 'Tutorials' from the Community menu. Use our search function to see if your tutorial topic has already been covered. Filter your search with the drop down features by category, software, and skill level. If your tutorial hasn't been created yet, click the red ' Create Tutorial' button seen below. How do you add a new tutorial? 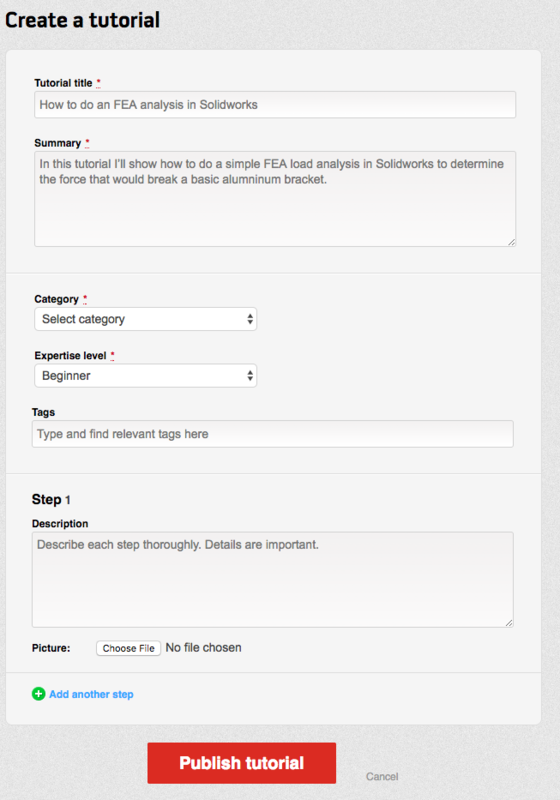 Fill in the fields as detailed as possible to represent what the member can expect to learn, the difficulty of the tutorials, the category it best fits in. Click the red 'Submit your answer' button to add the tutorial.